March, 2008: This is old stuff I wrote a while ago and published in numerous print and web publications in 2000. But this history may still be interesting for modern digital photographers. In writing it I was trying to document not only the early days but a trajectory of what might come. I really had little idea that I’d become as interested as I’ve become in photography. Please be aware that most of the tools mentioned here no longer exist, some of the companies are long gone, and some of the links may be broken. I’ll fix the links or get rid of them as I find them. As a person interested in both computers and photography I’ve followed the evolution of digital cameras and scanners. As a long-time Macintosh user I’ve witnessed and experienced the expensive, awkward, and interesting evolution of getting images into various Macintosh models through the years. What follows is a short history and comments on the current state of my experience with digital photography. In the early days (1985) I had a Koala MacVision video digitizer and various surveillance video cameras (the kind you see hanging in stores to spot shoplifters) for making images. QuickTime didn’t exist back then but we used full-motion video cameras to capture video images but had no way to capture movement; MacVision made snap-shots of the video input. It used an algorithm that seems crude by today’s standards which was made by Bill Atkinson (Apple guru who wrote QuickDraw, MacPaint, HyperCard). Remember, it was a black-and-white world back then, and it used dots in the most amazing way to represent black, white, and the shades of gray between them. I still enjoy looking at scans made with that algorithm (HyperScan) or images captured with my MacVision digitizer. When I taught computer graphics at the University of Oregon (before any of you knew me) my students used MacVision to do a number of amazing projects. One of them used the slow scan rate of MacVision, slowly rendering from left to right, to make eerie scans of people in motion. Next came the Canon Xap Shot camera which took still pictures on small proprietary disks and had a video-out port for connection to either MacVision or any other video digitizer. Focus Enhancements made a higher resolution (than the MacVision) video digitizer box called Computer Eyes. It was a larger metal box with two knobs on it for controlling brightness and contrast of incoming images. I used that setup for a number of years. Then Apple came out with their first flatbed scanner, the Apple Scanner, and the images it made from scanned photographs were so much better than what my video digitizer would do that I went back to my 35mm camera and film and the resulting prints, preferring to pay up front for film developing so that I could use the new Apple Scanner. This scanner used both AppleScan for scanning high resolution gray-scale images and HyperScan for scanning black and white images directly into HyperCard. Of course the film process is expensive, cumbersome and even with one-hour processing, time consuming, and you pay for your mistakes up front, but I stuck with it for many years. Some of you have seen presentations I made using images scanned with HyperScan. They look crude by today’s standards but HyperScan was so easy to use I used it a lot. This idea: ease of use leading to more use (and more expertise) is important to remember when purchasing any technology. A small company called Connectix came out with it’s little “ball” video camera called the QuickCam. This camera was relatively inexpensive, connected directly to a serial port, and used simple software to capture the incoming video signal as either a still snapshot or, using the new QuickTime, as compressed video for playback. The QuickCam sold well because it was inexpensive and very easy to use. Eventually Connectix improved it adding focus and then, color. I had a black and white QuickCam for many years and got a lot of use out of it. The limitation of this camera was and still is that it must be connected to a computer to work. Also, compared with more expensive camcorders (digital or analog) its sampling rate is very slow: QuickCam QuickTime recordings tend to look like dancing in a strobe light at a ’70s disco. There are current versions of this kind of camera from Connectix, Kensington, and many other manufacturers. Most of them work with USB and are relatively inexpensive. A few years later Apple came out with the QuickTake 100 camera which was expensive but interesting. I passed on it and good thing because within a year the QuickTake 150 came out with more adjustability and more memory for storing pictures. I passed on the 150 too. The problem with these cameras, unlike the earlier Xap Shot, was that they did not have removable storage and once full, had to be unloaded onto a computer. This meant that you couldn’t go far into the field taking pictures with them unless you brought along more than one camera or a portable computer (PowerBook) to unload the pictures onto. Then Apple came out with a version of the QuickTake that solved this problem, the QuickTake 200. This camera, actually made by Fuji and sold as the Fuji DS-7 as well as the Apple QuickTake 200 had removable storage in the form of Smart Media cards. These small storage cards allowed one to have unlimited storage in the field: once one is full, pull it out and put in another. I had to have one of these but when they came out they were too expensive. I waited as long as I could (about 2 minutes according to my wife) and bought one when the price came down. The camera was easy to learn to use and in no time I was taking pictures like crazy. Just like the earlier QuickTake models it did not have a good way to focus pictures instead relying on a little switch that had three focal positions: close-up, medium, and far away. Ugh! I never got pictures that were as sharp as I’d have liked because of this. Also, the camera had no rangefinder which meant that in order to see what you were composing you had to use the LCD screen on the back of the camera. This screen, which is low resolution and does not show focus of the lens, consumes large amounts of power and goes through batteries like water. This particular camera had no flash so one was limited in the kinds of pictures one could take with it. 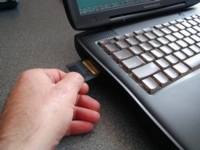 Getting images from the camera to the computer was done via serial cable. Unless you had an AC adapter (I did) you used up your precious AA batteries just getting images out of the camera. And, the serial upload was excruciatingly slow. No one had thought to make a Smart Media card reader yet so uploading from the camera was the only way to go. Finally, in typical fashion, Apple was ahead of the curve on the use of Smart Media and the media was expensive. It’s still expensive as I write this in February, 2000 but not anywhere near as expensive as it was when I owned the QuickTake 200. The 200 came with a 2 megabyte Smart Media card and I bought an extra 4 megabyte card for almost as much as the cost of the camera. Having been burned with the QuickTake 200 I decided to move back to film and my newer Apple Color OneScanner 600/27. I have a nice little Olympus Stylus Epic (under $100) which I highly recommend to anyone shooting film who wants a small, easy-to use camera that makes excellent pictures. I took two of these Stylus Epics to India and Japan (it’s reliable but when overseas a backup is important) and took many hundreds of excellent pictures with them which I scanned with my Apple scanner. Just like many of you I get all the Macintosh mail-order catalogs and instead of recycling them right away I scan them for the newest Mac stuff. I’ve been watching during the past four years as digital cameras have taken off. Price point, reliability, digital film (Smart Media and Compact Flash) and most importantly, high resolution images have turned these cameras into tools and toys that “ordinary” consumers want and buy. Last fall, just before a conference (Closing the Gap), Steve, a good friend of mine from my Oregon days came to visit us in Connecticut with his family. Steve had just bought his first digital camera. Being more conservative than me (it doesn’t take much) he had stood on the sidelines and waited and watched. Now he’d bought an Olympus C2000 and he had it with him to document their trip. Of course I was interested (drooling actually) and he allowed me to play with the camera so I could get a feel for how it worked. I was hooked. This camera takes amazingly sharp pictures, feels like a regular 35mm SLR, and uses digital film (Smart Media). It has a zoom lens, a flash, and enough controls to make you crazy or, if you’re a bit nerdy like me, play for hours on end trying to learn what they do instead of reading the manual. I got very excited but there was one thing that really sold me: the way he got images from the camera onto the computer which I’ll describe in detail below. As soon as Steve and his family left I went on the web and started doing research on digital cameras. My wife Anne knew what was coming and did her best to hold me back. It worked for a few months. 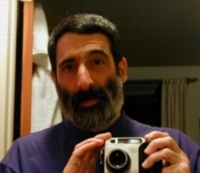 I found a number of places that had good information on all the leading digital cameras but none better than Steve’s Digicams (not my friend, another Steve). At this web site Steve reviews all the leading cameras from all the manufacturers in minute detail. I actually use his review of the camera I ended up with instead of the manual. So I spent days on Steve’s site after my friend Steve left learning all I could. Since his Olympus C2000 had come out, Olympus had come out with a new model, the C2020 but there were many other cameras to choose from and they all had good and bad points. I live in rural Connecticut. There isn’t a camera store or computer store close to us that has all of the cameras I was considering for me to get my hands on. Caveat: You must get your hands on the cameras you are considering. If you can’t see the controls or the camera is awkward in your hands or you can’t figure out how to do something that’s important or you don’t like something about it, better to find out before you’ve bought it. To solve this problem we drove into New York City just before New Year’s eve (okay, I was impulsive AND stupid to go into New York at this millennium madness time) and went to B & H Photo, a professional photo store that told me on the phone that they had all the cameras I was considering and would be happy to spend time talking with me and allow me to fondle the cameras. I promised my wife this was not a buying trip, just an information gathering trip. It was very worthwhile, even though the traffic in New York was the worst I’d ever seen and B & H was mobbed with a million people who were there for exactly the same reason I was, interested in exactly the same cameras. In simply handling and trying to use each camera, I eliminated all but one because the others were too hard to use or had other things I didn’t like. I ended up liking and buying (not from B & H) the Olympus C2020 (the newer model of my friend Steve’s camera). The Nikon CoolPix 950 was highly rated but the controls were hard to use and the manual was impossible. The Canon S-10 was wonderful but did not take AA batteries, instead using a proprietary battery of Canon’s design. This last point could have been figured out on the web but the Nikon had to be eliminated hands-on. Here’s a look at some of the points involved in my decision-making process. I do not pretend to be an expert but these are points that you should consider, among others, when looking at cameras. This is a measure of how many pixels the camera will record at it’s highest resolution. All cameras will step down to lower resolutions but what makes modern, high resolution digital cameras so wonderful is how close they come to film cameras compared to the older low-resolution models. There are a number of ways to describe resolution but the simplest is to get the total number of pixels on the piece of silicon that actually does the recording of the image. Olympus makes a popular camera, the D450 that records 1.3 million pixels. My friend Steve’s camera, the Olympus C2000 records 2.1 million pixels as does the Olympus C2020, the Nikon CoolPix 950, and the Canon S-10. Olympus has just come out with yet a newer model of my camera, the C3030 that records 3 million pixels and not to be outdone, Canon and Nikon also have models that records 3 million pixels. This will go on forever so you can jump on at any time! Or not. Virtually all cameras (even the old QuickTakes) support resolutions of 640 x 480. The 2.1 million pixel camera that I bought has 1600 x 1200 pixels so will support printing an 8 x 10 inch photo without distortion. The important question is, how much resolution do you need? Most people won’t notice much difference on screen between 1 and 2 million pixels but will notice a difference when they see the printed output. The difference between any modern digital camera and the old equipment I’ve mentioned above is so great that most people reading this who have not ventured into this area will be fine with a 1 million pixel camera. So, if this is you maybe you should consider other variables as well. Some of the current inexpensive (under $200) cameras do not have removable storage, or digital film as it’s beginning to be called. This means that the only way to get the pictures out of the camera is to connect to a computer. Not just any computer, but one with the installed software on it for uploading images (software for doing this comes with virtually all cameras). This limits the number of pictures you can take before you have to find a computer to unload and as I’ve said above, it’s the slowest way to transfer images. Sony Mavica cameras use standard 3.5″ floppy disks. Panasonic has just come out with a camera that uses Imation’s 120 megabyte superdisks. The two most popular ways, also called “digital film,” are Smart Media and Compact Flash. Olympus cameras use Smart Media (except their high-end camera, the C2500 that uses both) but most other leading cameras use Compact Flash for storage. Olympus is one of the leading manufacturers of digital cameras so don’t think for a moment that Smart Media is going to go away. JVC uses Smart Media too. Plus, it’s also used in devices like digital audio players for storing and moving MP3 music files. However, because Compact Flash is a more popular storage device it’s a bit cheaper, comes in larger sizes (IBM makes a 400 megabyte micro-drive which is a mini-hard disk in Compact Flash form) and there are more and cheaper “readers” to read the compact flash cards into your computer. This is an important consideration when buying a camera that uses digital film. It’s not quite the Sony Betamax story but you’d do well to understand what you’re getting into here. 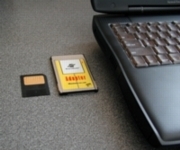 Smart Media cards are very small and thin and Compact Flash cards are a bit thicker. However, both of these are so small that if one could afford it, one could carry dozens of either of them in a single shirt pocket. Note: Since I first wrote this article I destroyed a 16 megabyte smart media card ($$) in front of an audience no less. I was attempting to show how straightforward and simple it is to take the card from the camera and put it into a computer and I scratched the recording surface of the card. This would not have happened with a compact flash card. When you research cameras make note of what kind of storage medium they use. I suggest buying at least one extra card (Smart Media or Compact Flash) for whatever camera you buy. My Olympus C2020 came with a single 8 megabyte Smart Media card and I bought two extra 16 megabyte cards (now I’m down to one). This allows me to take pictures at my camera’s highest resolution and have enough room to store about 85 pictures on all of my cards together. I also suggest buying two 16 meg cards rather than a single 32 meg card? Why, because it will give you more flexibility in storing and categorizing pictures before you unload them and if you destroy one as I did you’ll have a backup. Most modern mid to high end digital cameras come with a video-out port for displaying images on either a TV or on a video projection device to share with a large group. TVs don’t have great resolution but for showing slide shows to groups they actually beat having an album of prints on someone’s lap: the TV can be seen by everyone in the room. Plus, the Olympus C2000 and C2020 have a nifty infrared remote control for releasing the shutter and for moving through images displayed on the TV. Cool! Put the camera on the TV aimed at the couch, plug it into the TV, sit back with your remote and move backward and forward through your pictures. Olympus is the only one to have this feature, so far. All cameras come with a serial cable and software for moving images from camera to computer, just like the old Apple QuickTakes. I never installed any of the software that came with my C2020 nor did I take the cable out of the box. When my friend Steve wanted to move pictures from his Olympus C2000 onto my computer (a G3 PowerBook with USB running OS 9) he plugged a USB cable into my USB hub, plugged a Smart Media card reader onto the end of the cable, took the Smart Media card out of the camera and put it in the reader (like a tiny disk into a tiny disk drive) and the card mounted on my desktop immediately. No software, no nothing. With OS 8 one would need to install a small USB driver but that’s it. Any USB Macintosh running OS 9 will recognize the card reader immediately. The Smart Media card mounts on the desktop just like a disk. Open it up by double clicking on it and there are all the images. You can then open the images with QuickTime Picture Viewer (comes with the Macintosh) or any graphics program that will open jpeg images (Graphic Converter, etc.). On better cameras you can also save the images in the camera in other formats like TIFF to preserve even higher resolution (at a cost of fewer pictures stored on a card). Simply drag the images onto your computer. The copy time is very fast, about as fast as a hard disk copy. Take the Smart Media card out (drag it to the trash, just like a disk) and put it back into the camera. I noticed that if I erased the card on the computer (using “Erase Disk” from the Special Menu) I got one fewer pictures on the disk so I use the camera to erase cards. Simple and easy. The first Smart Media reader I bought was the USB CameraMate from Microtech, a respected hardware manufacturer that’s been around for years. The cool thing about the CameraMate is that it will read both Smart Media and Compact Flash. The CameraMate needed a special driver, even with OS 9, which I installed. But for some reason my Macintosh started crashing when reading cards with the CameraMate so I returned it and uninstalled it’s driver. I ended up buying a Smart Media reader called FlashGate made by a Japanese company called Hagiwara from a place I found on the web called PC Line (they also sell cameras). The FlashGate is not flashy (pun intended) but does the job well. It comes with a CD with a USB driver on it but if you’re running OS 9 you won’t need to install it. If you’re running Mac OS 8 or Windows you will. The FlashGate is the same card reader my friend Steve uses and both of us have had no problems with it. Olympus also makes a USB Smart Media reader that looks even better. It wasn’t out when I bought the FlashGate but it looks smaller and costs the same. If you buy an Olympus camera you can probably buy the Olympus Smart Media reader at the same time. B & H sells it, as do other places. 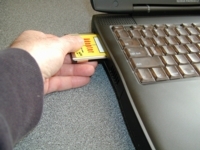 If you’re a PowerBook user and want an even simpler, smaller, and cheaper tool to read cards you might consider a PCMCIA card that gets inserted in the slot on the side of your computer. If you have a PowerBook and decide on a camera that uses Compact Flash PCMCIA card readers are very cheap: in the $10 range. If you have a PowerBook and decide on a camera that uses Smart Media (like me) PCMCIA Smart Media readers are more expensive, in the $50 range. The same company, Hagiwara makes the PCMCIA Smart Media Adapter and the above mentioned PC Line sells them. 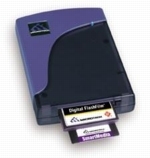 Because I’m a PowerBook user (exclusively now) I bought one of these Hagiwara PCMCIA Smart Media Adapters and it works perfectly, no drivers or anything. My FlashGate is in a drawer although I’ll carry it when at friends houses who have iMacs since it will allow me to easily give them pictures. Batteries were a sore point for me having gone through enough AA’s to power a small city with my QuickTake 200. I knew two things: I wanted AA rechargeable batteries and I wanted to be able to turn off the LCD viewing screen on the camera to preserve battery life. All of the mid and high end cameras now allow you to turn off the LCD viewing screen and all cameras have rangefinders for composing images, so aside from using the built-in controls that are displayed on the LCD screen, it rarely needs to be turned on. The Canon S-10 uses a proprietary battery that only fits into that camera. It is disposable: once it runs out you chuck it and get another. Yikes! Plus if you want a rechargeable version of it you have to fork over another $100. The Canon had other things going for it that the Nikon and Olympus did not (smaller in size, built in lens-cap) but the battery situation eliminated it for me. The Nikon and Olympus both come with 4 AA NiMH (nickel metal hydride) rechargeable batteries plus a charger. These batteries will hold a charge for up to 10 times longer than Duracell AAs and can handle over 1000 cycles of draining and recharging. Plus, unlike other rechargeables, they have no memory so you can recharge them at any time and still get a full charge out of them. After buying my camera I went online to look for a set of replacement batteries and found Thomas Distributing (through Steve’s Digicams), a company that sells NiMH replacement batteries for digital cameras (and cell phones, etc.) at a good price. You can do price comparisons online or shop at your favorite store. All of the Macintosh mail order houses sell all the Olympus digital cameras, the Nikon CoolPix 950 and 800, and the Canon S-10. B & H also carries all of them plus a number of digital film readers. I ended up buying my camera from Outpost.com because I like the fact that they’re a web-only mail order house (they don’t send out endless catalogs), they’re right down the road from me in Kent, Connecticut, and they have a no questions asked return policy on anything you buy from them. They’re not the absolute cheapest price but the return policy makes up for spending a bit more in my mind. I love my camera and have no regrets about the kind of camera I bought. The Olympus C2020 is not perfect and it will be interesting to see how many of the problems I’ve found in it they’ve fixed on the C3030. My biggest complaint is the lens cap which is a total drag just like it is on a regular old 35mm SLR: if you leave it on when turning on the camera the camera goes nuts trying to extend its lens. When you take it off what do you do with it? Lose it of course. So, get a “lens-cap keeper” from a camera store and attach your lens cap to the shoulder strap mounts on the camera. Not a pretty solution for a high tech camera but it works. The camera should have come with a little wallet for holding the Smart Media cards. It didn’t and the cards come in small, plastic cases which are useless. I bought a small Smart Media card wallet that holds 8 cards. It’s the thickness of a disk and about the size of a bookmark. Of course if you buy a brand new, high resolution digital camera you need a high resolution color printer to go with it, right? Maybe. I still have and love my Apple LaserWriter 12/640 PS and I will continue to use it until it dies or they no longer make toner cartridges for it. I found out about Shutterfly first but when using their site found that the credit card page was not secure. Amazing in this day and age to find an e-commerce site that does not have a secure page for taking credit cards. I also noticed that they required the downloading of a special browser plug-in for uploading images to their site. No problem, I did it but never finished the transaction because of the insecure e-commerce page. So, I skipped over to Printroom.com which did have a secure page for taking credit card numbers and did not require any special plug-in for my browser (Navigator). I made an account, uploaded images into a gallery (make sure the images have the “.jpg” extension on their file names), decided how many prints at what size I wanted on what kind of paper and hit a button. The prints arrived a few days later and they are wonderful, as good or better than the best color ink jet printer one would buy as an individual (they use photographic process, not ink jet on quality paper) and the cost is quite reasonable: $0.39 for a 4″ x 6″ print, $3.95 for an 8″ x 10″. For the time being, this is the way I’ll make prints and I’m quite content. I’ve now printed about 50 pictures with them and I’ve not been disappointed yet. There is one underlying reason why a digital camera or a digital anything is wonderful and I haven’t mentioned it yet. You can make all the mistakes you want and it costs you nothing. If I shoot a roll of 35mm film and have it processed, I don’t see the problems until I get the pictures back. I’ve already paid for the prints, whether I like them or not. A digital camera lets me sort out the junk before I print and when this is fed back into the recording process it allows me to record like crazy without thinking of the cost of printing.